I'm bringing you a bit of out-and-about colour this week. 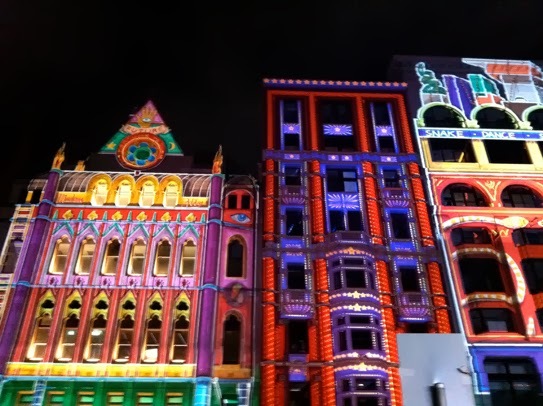 Last night was White Night in Melbourne – an all-night arts festival based on the original Nuit Blanche in France – a variation of which is now held annually in about 20 cities all over the world. All the public galleries, art spaces and museums are open for the night hosting various exhibitions, installations and performances. 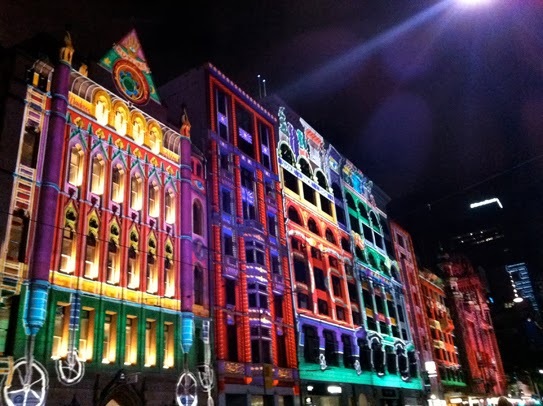 Along with the events, a highlight of the Melbourne festival is the light projection along a stretch of Flinders Street. 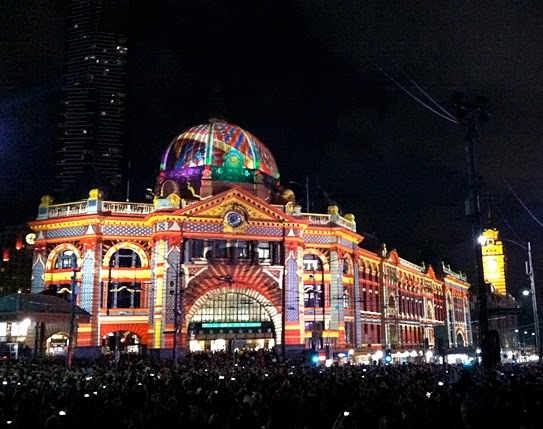 Starting with Flinders Street Station (shown below), a series of artworks is projected onto buildings along the strip. The images changed every 20 minutes or so, and this year they were all based around a circus theme. The images are designed around the shapes of the buildings themselves – just amazing. The pictures above are of the Forum Theatre. 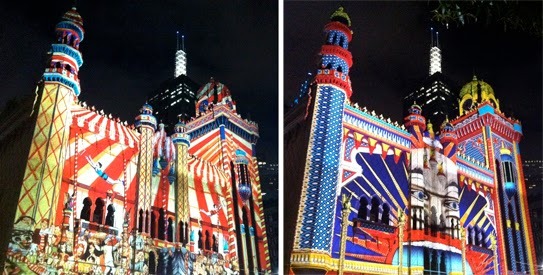 You can see the big top image on the left and the Luna Park-inspired one on the right. And again here, the pictures above and below are the same buildings with different projections on them. There was also a little church down an alleyway between some of the buildings that had a moving projection on it. The projections are done by a company called Electric Canvas. You may have seen some of their work during Vivid Festival in Sydney, where they light up city landmarks each evening including the Sydney Opera House. They've also done a number of Olympic Opening Ceremonies and New Year's Eve events. There were thousands and thousands of people out last night and it was a great atmosphere. You can see the crowds outside the station in the top picture where they shut the street to traffic for the night. 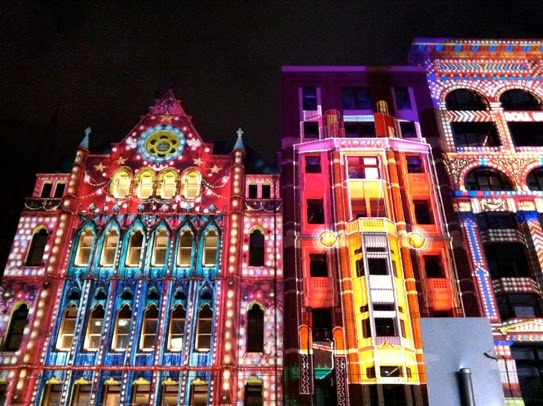 I never got around to doing the Vivid Festival in Sydney (usually working! ), so I'm really glad I got to experience this little piece of White Night – it was stunning. Wow! These are fantastic! What an amazing display. Thanks for sharing.